Recently Auckland Transport celebrated hitting the milestone of 90 million trips annually. 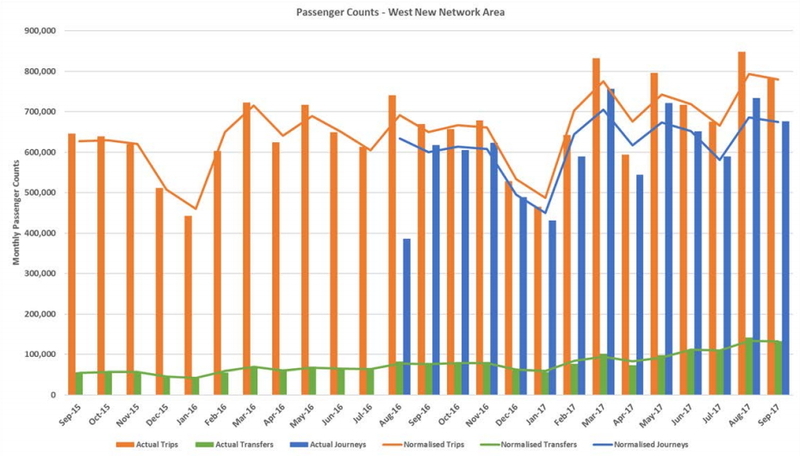 While we knew that high level number, we hadn’t talked more specifically about ridership in August or September as the numbers hadn’t been published. That and after they were things got a bit hectic around here. Like the two months that preceded it, August this year had the exact same number of working days and weekend days as the same month last year. 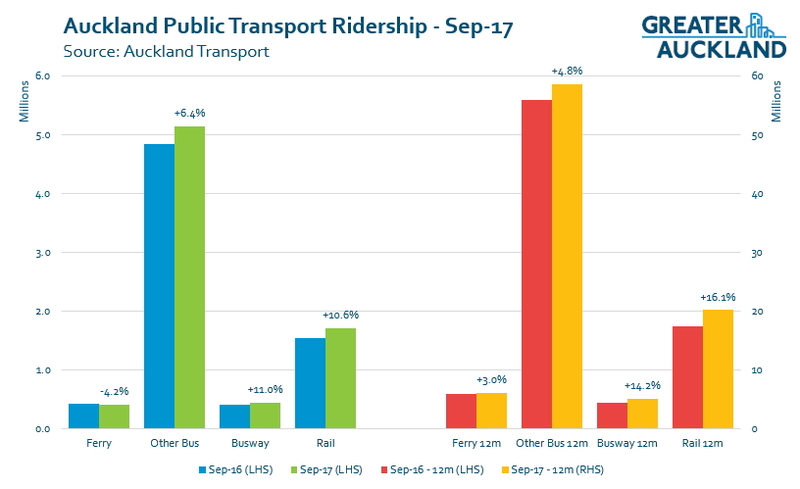 This gives us a great base to compare to and all metrics showed some growth with rail and the busway once again leading the charge in percentage growth. However, good growth from other buses saw them grow more overall given the higher starting base. September saw one fewer working day than September last year. Like August, September saw decent growth in PT with a notable exception of the ferries which were down around 4%. 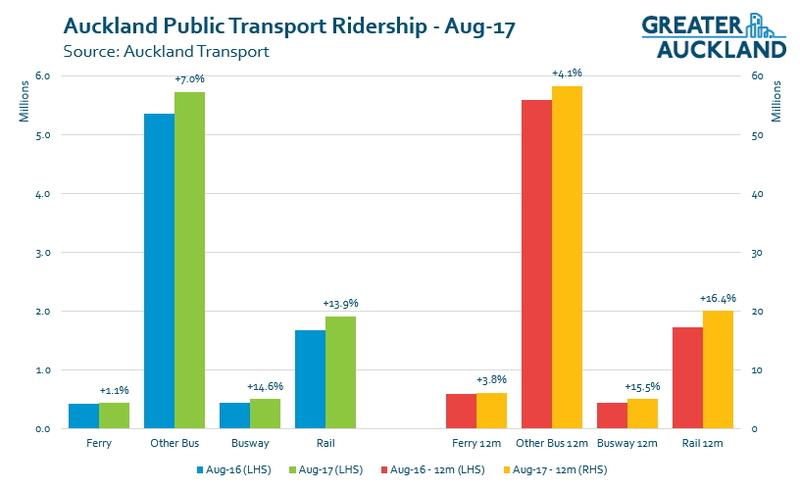 Also like August the non-busway buses saw greater overall growth than the rapid transit lines, despite a lower growth percentage. As well as the normal stats report, the business report has a number of pages looking at how the New Network is performing in South and West Auckland. One of the advantages with this reporting is that it also looks at total journeys, not just individual trips. 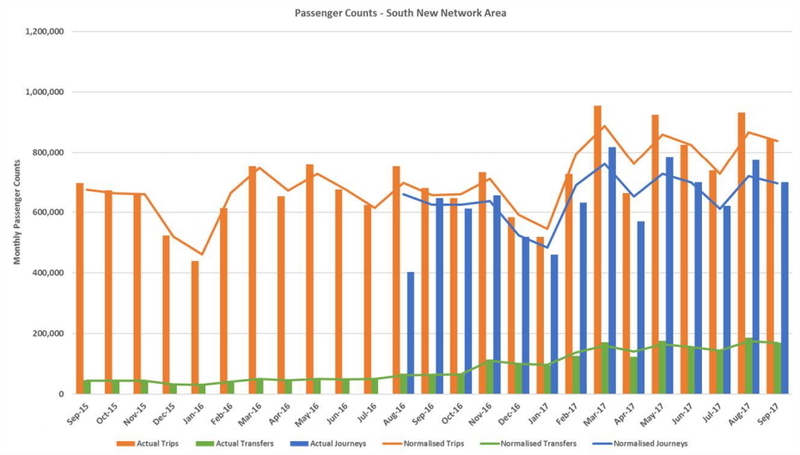 After rolling out at the end of October last year, the new network in the south is going well with AT saying trips (boardings) are up 24% while journeys are up 13%. It’s a little bit messy but this is shown on the graph below. It also shows transfers are picking up with AT reporting a 168% increase in transfers. The New Network only rolled out in June in the west but there are already good results. For September, trips increased by 20% and journeys 13%. We obviously need to give it more time but early signs are promising. The total public transport farebox recovery ratio was 46.4 percent in the month of September 2017, slightly below the SOI target range of 47 to 50 percent. This reflects the impact of the introduction of Simpler Fares in August 2016, which reduced fares for the majority of users, and the increased capacity on bus services from February 2017, which were less utilised in months of lower demand such as September 2017. Forecast patronage growth will partly offset both of these impacts and the SOI target is forecast to be achieved for the 2017/18 financial year. One positive is that the continued growth in rail usage is seeing the subsidy per passenger km for rail continue to fall. Electrification sure has had a positive impact. The average number of trips on trains on weekdays over the year to the end of September has now surpassed 70k. Buses are also increasing and are carrying nearly 220k per weekday. Some good strong numbers all round. Good to see the new network bus areas journeys both up 13%. What is the difference between the blue/green and red/yellow graphs? Why are the axes different? Left is for the month. Right is for the 12 month period ending with that month. I always take a little while to figure this out each time. Do you mind putting labels on, Matt? I see now that there is a label, it’s just too small to really be fit for purpose. It could be as simple as putting it in bold. Which new heavy rail do you mean? 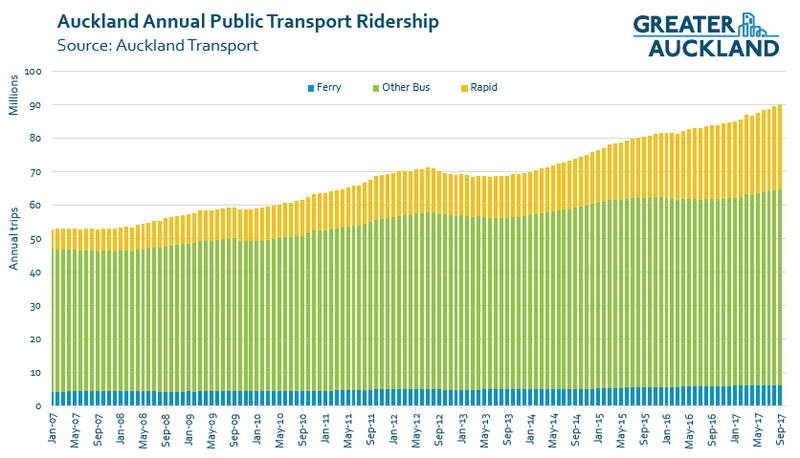 I just don’t get how AT can be proud of increasing annual public transport trips by only 7% each year, or on current usage by 6.3 million trips per year. Last year the number of cars registered in Auckland increased by slightly more than 35,000. It is reasonable to assume that most of these cars were bought for the purpose of travelling to work, as economically to buy a vehicle just for weekend usage is not sensible. If we multiply that 35k by the number of working days in a year (assume 220) and then by 2 (the number of trips per day) then we have 35,000 x 440 = 15.4 million extra vehicle trips per year. And there is no end in sight with Ports of Auckland planning on a huge number of used car imports over the next few years. So car trips might be increasing at more than twice the rate of public transport trips. If AT is at all serious in meeting the first goal in its Statement of Intent – “Prioritise rapid, high frequency public transport” then it has to do things completely differently, because facilitating current passenger vehicle growth will ensure that AT won’t have enough money for public transport funding requirements. There needs to be a radical game changer and while the CRL will help; as will airport and northwestern trams they seem unlikely to significantly impact on increasing motor vehicle trips. Huge annual tax on each car and carpark, and free public transport. Heidi, I certainly think that AT can significantly ramp up parking prices. I suspect that over the city there is millions to be made annually. As I walk around the city AT car parks seem to be the cheapest. Let them increase prices to get a decent return and funnel the profits into roading expenditure to keep that sector happy and divert money to public transport spending. I am also not averse to selling a parking building or two. The downtown site must be particularly valuable. Yes closing the downtown site might be a good first step rather than say putting roads into the city on a car diet. It would be cruel before the central bus new network kicks in though. Reduce cars into the city by reducing parking spaces rather than necessarily the price. Thinking more on that…the downtown area currently is the most accessible by other mode; ferry train bike bus. There is the viaduct Car park still, but a little further away which is actually a good thing. Post CRL opening you could ramp up prices for say the Aotea carpark especially but really all car parking. People visiting the city on the weekend from say rural areas could park and ride to outer train/ busway stations with good later services provided…Something to promote. Cars are mostly parked. More cars does not, necessarily, mean more driving. In fact kilometres traveled percapita in AKL is still falling. Car numbers and traffic volumes, while obviously related, are actually not the same thing. However what we build directly influences this; build more high quality Transit; we will get higher ridership, more m’ways and parking, we’ll get more driving. Clear decisions around this are necessary. T-i is looking for a radical game-changer. Although there are places where there are many cars per capita and driving rates are low, this isn’t actually a good solution – what a lot of waste: the technology, the resources and the space. In NZ the relationship between car ownership and driving is strong, according to the household surveys. Of course GA’s approach of campaigning for better PT choice is politically the most effective way forward. But let’s say we actually had to curb our carbon emissions – say some big blocks of countries became clever/aggressive and specified membership of trade agreements was dependent on actually reducing carbon emissions to some low “sustainable” rate… what would we do? Ie, what is a radical game-changer? Free PT and huge taxes on the private car. But we could take responsibility earlier than that. AT isn’t serious. It’s mission statement is just fluff. it basically says “Our mission is to be a transport agency.” No real commitment to anything except the status quo. Across populations, an increase in cars results in an increase in driving. I would imagine in Auckland’s situation, the extra driving wouldn’t be at peak hour but off peak. Often it’s the local trips that really cement the car dependency. Thanks Russell B. So that’s one and that certainly doesn’t qualify as lots. With your limited driving you may not be aware that congestion is continuing to increase. Measures to halt that increase don’t appear to be sufficient and so congestion will grow. If that increase is at say 7 million trips per year then the advent of the CRL in 2023 to add about 5 million passenger trips is only a drop in the bucket to reduce the congestion. As unpalatable as it might be initially, for example, an increased new car registration charge;an increase in annual car registration fee; increased parking charges that go to improving public transport options / reduce the cost of this might be the tipping point to substantially increase public transport usage. You appear to appreciate that alternatives to driving petrol cars are great for the environment. Reducing car imports and fuel purchases will also have a significant impact on our external balance of payments deficit. Ari, absolutely right. I have just read the AT annual report and Lester Levy has said all the right things -laid it on with a trowel. And then you read the figures! Of capital expenditure of $724 million, $431 million was spent on roads (60%). And this is when AT is “Prioritising rapid, high frequency public transport.” It begs the question prioritising over what? Investing in rubbish tins? Putting a much needed pedestrian crossing on The Strand, Takapuna? And roading spend is up from 337 million last year (+28%). And in 10 years AT has not been able to reduce traffic flow to the city at all. Yes thousands more on public transport but no reduction in cars! The organisation is a joke and Phil Goff needs to point them in the right direction. Is there someone there on drugs? But it’s far, far worse than that. This is a management sanctioned report. Do they actually believe that this is any way helpful? Do they think that we are so gullible that roading expenditure can be justified by a pedestrian experience? These clowns don’t live in the real world. It’s all about time. Most people resent losing over 1 hour of their time every day while trying to get to work, and home again. The lucky one have a choice of modes, the unlucky do not. These latter are mostly the car-drivers, because pax can use their lap-tops or phones etc while riding. The car drivers are often to or from outer suburbs, to or from work not on a PT route, or otherwise have to make a transfer, which extends one’s journey to one & a half hours. One way. Do they even realise that the Southern is at a standstill each weekday morning, Drury to Takanini, 0530-0730. What time must some of these folk get up ? There goes the night out. Many car drivers would be glad to take PT if it worked for them. Driving is a last resort, not a first choice. A petrol tax will merely lower the disposable income. It’s all about time. Chris, is there some angle about this that could help you write a post? I think a post describing the toll the long commute takes – whether in traffic or PT – would be really good.